As well as Sindy's Car and Wardrobe, in 1966 Sindy was given two more accessories and her own record. With its comfortable rose-sprigged covered vinyl mattress, white sheets, pillow and luxurious quilted, lacy bedspread, it was truly a bed created for a princess. The original version of the bed (shown top left above) had a bedspread made of satin with five layers of frills trimmed with old-gold silk thread. Later versions (shown top right above) had a bedspread made of nylon and only has three layers of frills with the trim made of yellow nylon thread. 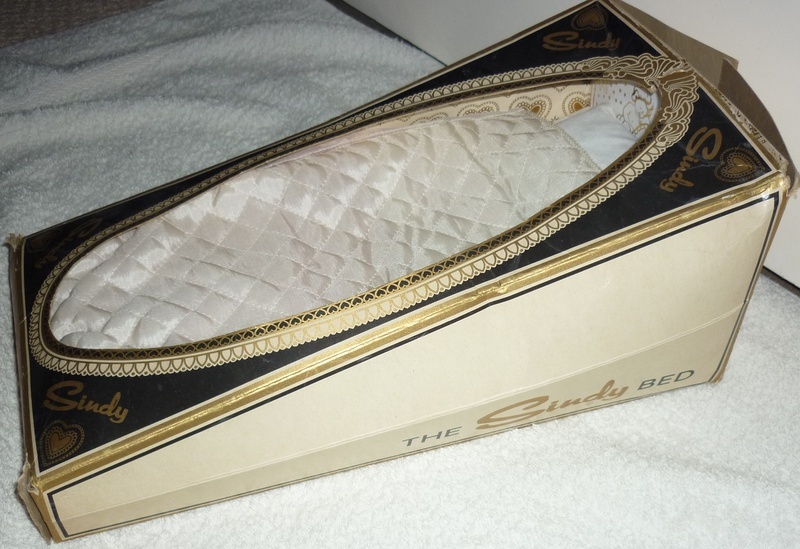 The very first Sindy bed was issued in a cheese-wedge shaped box, which had neither the styling nor branding of any of the other Scenesetters. This bed was available in 1966 and 1967 before changing slightly in substance (mattress, base and bed linen). It still retained the catalogue number (12SA3), but it was re-named 'Sindy's Bed and Bedclothes', and was packaged in the standard box design of 1968. It had always been our understanding that it was the later beds that came with free extra clothes, originally the 'Cosy Nights' dressing gown (but in all probability whatever Pedigree had to hand in later years). However, the photo above clearly shows that the 'Cosy Nights' dressing gown was included with at least some of the earlier boxed sets. There are subtle differences between the early issues of the bed. These include such things as the headboard cherubs design being (a) tampo printed or (b) intaglio printed or even (c) surface moulded. There were also subtle changes year on year right into the 1970s, including changes to the casters, legs, base itself, mattress and bed linen, which would also explain the different designs and vinyl used for the mattresses. We have seen a number of patterns for the vinyl mattress ranging from small rose sprigs to large blooms (the mattress was predominantly available in blue, but we have also seen pink and yellow versions), but they are very difficult to date unless they are still mint in their boxes. This might also explain the silver Cherub headboard which a collector has told us about, which was thought to be defective and was subsequently thrown away – oh dear if only they had known! At last Sindy got a horse to go with her lovely 'Pony Club' outfit. We struggled to identify the correct first edition of Sindy's horse. According to 12S Magazine (edn 7), Sindy's horse was moulded from several sections of plastic which needed to be glued together and which was then hand-finished. But it took considerable effort to prepare the horse for sale, so subsequently the horse was covered in a velvet flock which helped to cover the joints between the glued sections and reduced the need for hand-finishing. "I would like to share my recollection about early Sindy horses because your site is the first time I've seen a photo of the sliver grey flock version, other than the actual ones my sister and I each had, and which I believed to be the "first editions". The reasons for this are: we both got our first Sindy dolls quite early in the 60s and started collecting clothes. We were very excited to learn that a horse was coming out - from advertising I assume (tv? or catalogues included with the clothes?) and we each got one for my birthday (we always got presents on each others' birthdays, as well as our own) Presumably this was in 1966, although I cannot be 100% sure. Anyway, we both got silver grey flock horses with white manes and tails. I remember my dad explaining that our mum had tried to buy us different colour ones (my Sindy was brunette and my sister's blonde so we knew whose was whose) but the toy shop owner told mum that they were only first available in the grey but that other colours were planned to come out later. Each horse came with dark brown plastic saddle and bridle with silver plastic bit and stirrups - these were all quite fragile. We had red plastic water buckets and nose bags made of cream hessian type fabric trimmed with brown plastic. The "Sindy" logo was on the nosebags in brown on the cream material. There was a lot of minute workmanship in those nosebags. There were blue plastic grooming brushes (like those supplied with Sindy's "Pony Club" outfit) and a plastic comb which was a paler blue, semi-circular in shape with thin teeth - these were very fragile too! There was indeed a broom as well, made of dark brown plastic with conical bristles of the same material (full length handle in Sindy's terms). When we next saw Sindy horses in the shops (I can't say how long after we first got our grey ones) they were the dark brown shiny plastic, with dark manes and tails seen in a number of pictures. Again, I clearly remember my dad surmising that they had stopped making them with the flock covering because it would be cheaper to simply make them in shiny plastic. Like so much of the Sindy range, the horses and accessories were beautifully thought out and produced and we had so many hours of enjoyment from them - so, hopefully did our Sindys who went riding a lot!" We have actually seen the flocked horse with both grey and brown flock. The brown flocked horse had a bright chestnut mane and tail (not shown). This flocking is fragile and can easily be damaged. In fact, both the flocked and smooth plastic horses are now very brittle and can easily loose a leg if dropped. They all have painted eyes and flowing manes and tails; silver for the Grey flocked horse and light brown hair for the smooth Chestnut horse. The Grey had black painted hooves. On these models the left foreleg is bent. These horses had a brown plastic saddle with silver plastic stirrups and a harness and bridle of brown plastic with a silver plastic bit. A rosette, intricately made with red cotton with a blue plastic round disc stuck onto it with 1st painted on it, was attached to the bridle of the flocked horse at the left temple. We have found the smooth Chestnut horse with a finely moulded red plastic rosette with a blue paper centre with a white 1st printed on it. They originally came with a cream hessian & brown plastic vinyl nosebag with a real brass buckle for the strap, a bucket, yard broom, horse brushes and a curry comb (not shown). Subsequently, Sindy's horse was named Peanuts following a competition in a girl's comic. Whilst not strictly a scene setter, we have included this for the sake of completeness. 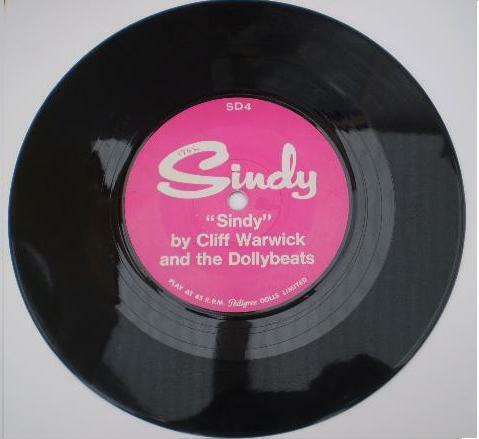 Here is Sindy's 45 rpm single written and recorded for her by Cliff Warwick and the Dollybeats. Paul had a poster of this group in his 'Time Off' outfit. 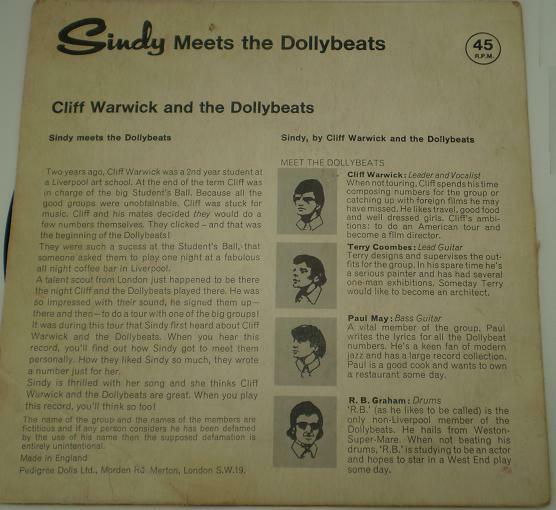 One side of the single tells the story of how Sindy wanted to see her favourite group "Cliff Warwick and the Dollybeats". On the way to the theatre to buy a ticket, she stops to help a little old man cross the road. When she gets to the theatre, all the tickets have sold out and so she heads home shedding a few tears on the way. As she nears home she meets the old man again, who turns out to be Cliff Warwick in disguise and he invites her to see the band rehearsal with her own front row seat. It is the happiest day of her life. The other side is Sindy's song that the band have written for her. "Dollywow"
The reverse of the record cover tells you about how the band were formed and about the band members themselves (definitely modelled on The Beatles). It's worth a read and is a wonderful piece of 60s memorabilia. 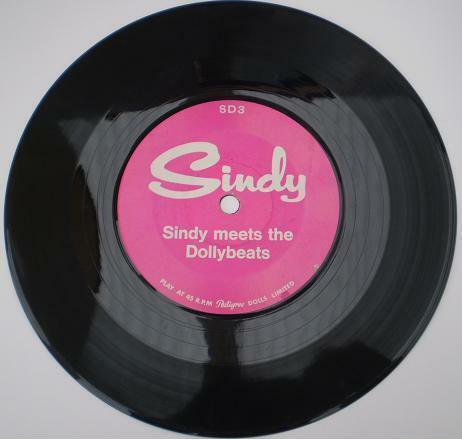 If you would like to hear the story of how Sindy meets the Dollybeats and the Sindy Song itself, please click on the sides of the record below. When the record has finished or you have had enough, just click on your 'back one page' internet browser button to return to this page, or if a separate window opens for your media player you can just close it. 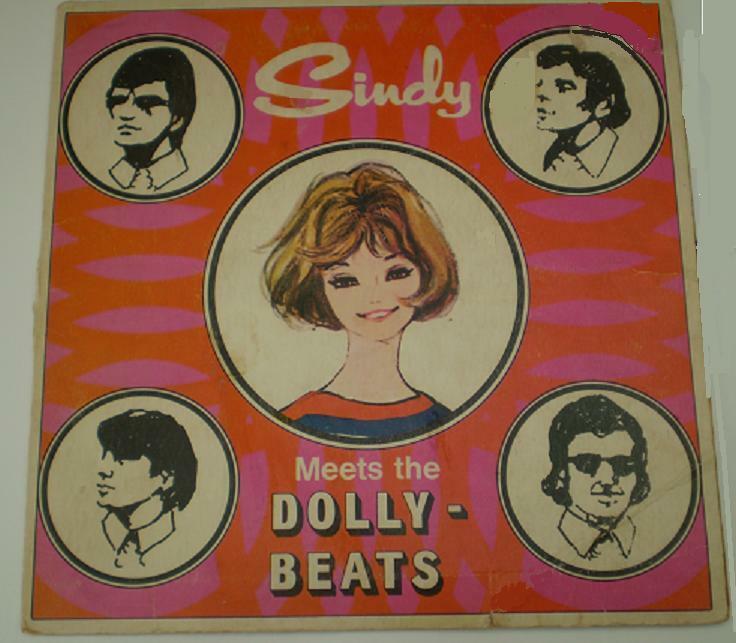 The recordings of how Sindy meets the Dollybeats and "Sindy" are reproduced with the permission of Pedigree Group Ltd.